The IMF becomes the latest mainstream organization to abandon the recovery. 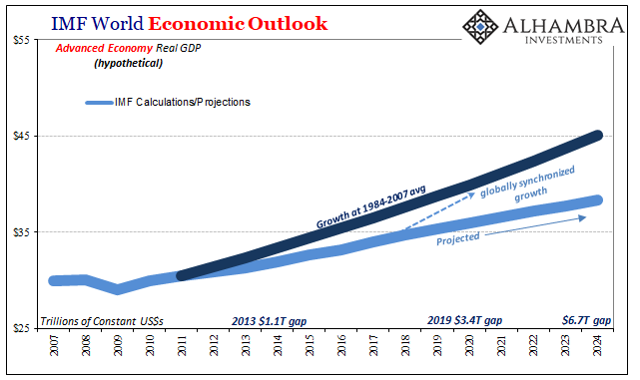 What is demanded is a real answer, not more dovish central bankers clumsily deluded about yet another QE or some different (but same) variety of LSAP. The real solutions to our global predicament lie in 2011. The IMF becomes the latest mainstream organization to abandon the recovery. It wasn't really much of one to begin with, mostly just the hope that an uptick in growth would lead to the long sought, and necessary, completion. Globally synchronized growth in 2017 was supposed to mean a plausible pathway toward it. Within months, maybe weeks, of publishing that report we had already witnessed the first major signs of reversal. The eurodollar system exhibited all the wrong sorts of tendencies, from repo markets to cross currency basis and a lot in between. 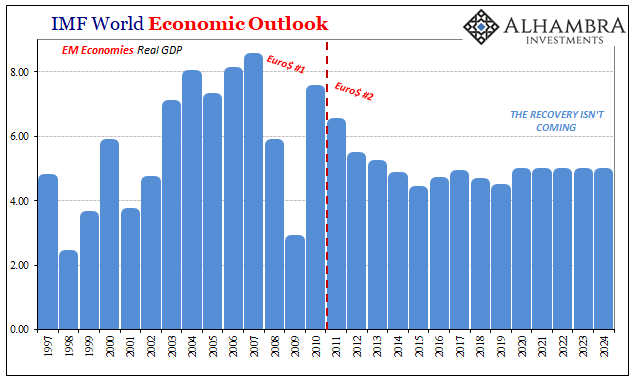 It would only get worse from there, and by early in 2018 the global economy was already caught up in a deteriorating situation. But it took until 2019 for anyone to admit the possibility something was wrong, let alone actual conditions already very wrong. 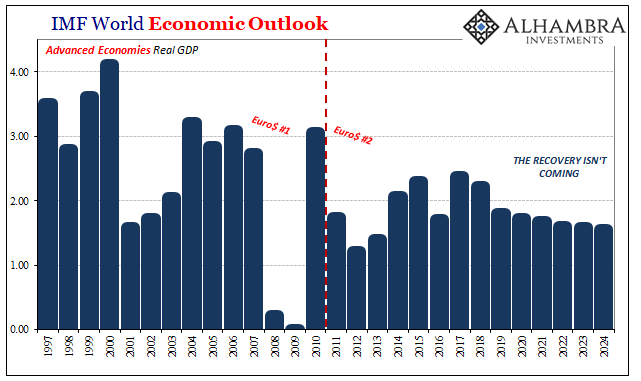 In its April 2019 WEO the IMF finally acknowledges, under "trade wars," of course, this "tightening." Trade tensions increasingly took a toll on business confidence and, so, financial market sentiment worsened, with financial conditions tightening for vulnerable emerging markets in the spring of 2018 and then in advanced economies later in the year, weighing on global demand. This unexpected "financial tightening" economists want to blame on "trade tensions" has canceled the anticipated recovery. To start with. It was the advanced economies, the US together with Europe and Japan, which were really set to take off under globally synchronized growth. 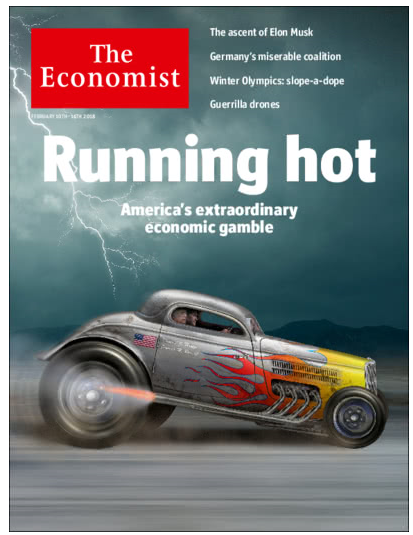 Whereas EMs had their reckoning in 2011, the developed world stepped out of the Great "Recession" already debilitated. This was at first called the "new normal" but 2017 was supposed to have meant its end. Even if it wasn't the old normal, it was expected to end up significantly better than the prior decade. This was nothing more than the typical up/down cycles between eurodollar squeezes and reflation rebounds. What happened two years ago was in desperation policymakers and economists all around the world projected their emotions onto Reflation #3. They made it out to be much more than it ever was, some quite purposefully. In the wake of 2018's wrong way turn, that's all done; the towel has been thrown. What that means in terms of long-range growth is the real horror. The global economy remains stuck - just as we've said all along. Between 1984 and 2007, according to the IMF's numbers, the economies of the advanced world together averaged 3.05% growth (including recessions). Since 2010, they've averaged just 1.87% growth. The latest projections show this isn't going to change. Far worse than any crash, this is the absolute worst case. A lot of it has to do with mistaken impressions, too. At first review, it really doesn't seem like all that much, a little over 1 percentage point reduction to growth. However, the difference between 3.05% and 1.87% is an absolute chasm; an incomprehensible gap into which flows all sorts of very bad things. To illustrate this, if we start in 2011 (why is it always 2011?) and plot actual growth against what real GDP in the advanced economies would've been had they resumed the pre-crisis average, the difference is already mind-boggling. Whereas by 2013, the gap had exceeded $1 trillion, somewhat manageable spread across the DM world, by 2019 it is now expected to be $3.4 trillion. 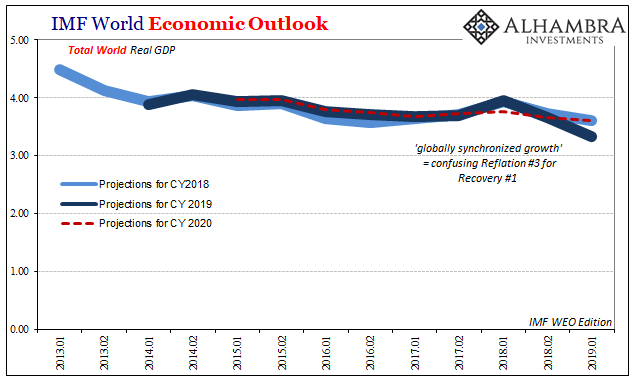 What central bankers in particular had hoped was 2017's globally synchronized growth even if it didn't amount to full recovery would push the collective output back up closer to the other situation. Perhaps even enough to begin repairing all the social and political damage incurred along the way. But this is only one piece of the dysfunction. This worst-case scenario is actually two problems smashed together. You have much, much weaker growth in the post-crisis era as well as that massive drop during the Great "Recession" which precedes it. 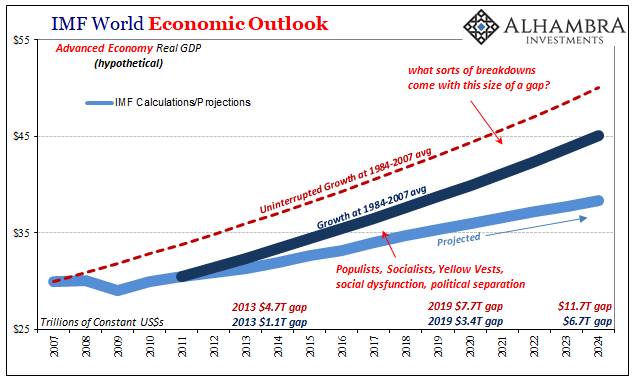 Therefore, the true scale of the problem isn't $3.4 trillion in 2019, it is going to be something like $7.7 trillion (or about a 20% shortfall!) In between 2013, when the gap was $4.7 trillion accounting for both deficiencies, and now the world spun into more and more crazy. What happens by 2024, when being stuck in this economic condition the advanced economies fall behind by nearly $12 trillion in total? If there is a lot of really angry people at $8 trillion, as we know there are, how many more might there be 50% further behind? How much more distrustful and militant will those already threatened become? Those, obviously, are not questions for the IMF to answer. 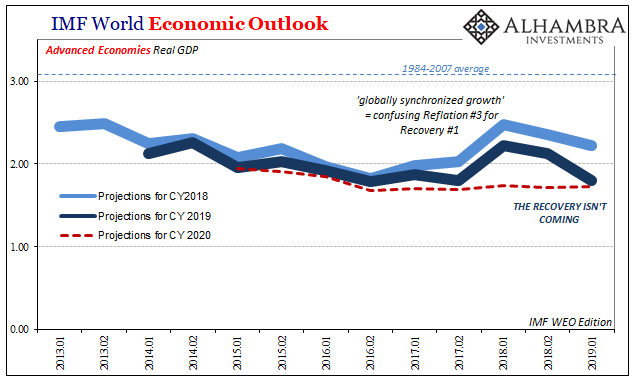 Their April 2019 WEO update merely confirms that the global economy remains on the same track to keep reckoning with these very uncomfortable even dangerous questions. For the most part, I think, people around the world have been remarkably patient. By and large, with few exceptions, populations gave authorities the clear benefit of the doubt, every chance to succeed. After eleven now twelve years, it has become quite apparent to many that's just not going to happen. And as this economic gap only widens, it will become apparent to many, many more even if they've never once paid attention to a single GDP report. You don't have to ever have calculated the spread between 1.87% from 3.05% to know its effects. What is demanded is a real answer, not more dovish central bankers clumsily deluded about yet another QE or some different (but same) variety of LSAP. The real solutions to our global predicament lie in 2011. Why always 2011.